How would you like to improve the success rate of achieving your objectives in your career and in your personal life? At work, you usually plan without sufficient data and sometimes without clear objectives. At home, you plan mostly for the short-term without any idea whether the plan will affect you in the long-term. How to make sure that your decision or your plan will get you to your target? The answer lies in Strategic Thinking. What you need to succeed consistently is to develop a strategic thinking mind set that will help you plan strategically. This will increase the success rate reaching your target. 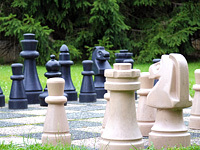 Learn how to strengthen your strategic thinking skills at this workshop. Through case studies and practical thinking exercises, you will improve your strategic thinking, learn to recognise patterns that impact strategy and get you to where you want to be. Attend the workshop and watch your success rate soar. Managers, executives and business profesisonals who want to improve the success rate of achieving their career and life goals.